"What a bewitching story! I had forgotten how fun young-adult books were. Not only was I captivated from the time I read Wish Amulet and Voodoo Spells and Chants, I couldn't put Magic by Moonlight down until I found out what happened to the three friends who uncovered a hidden secret." "Melding history with fantasy is a great way to learn about the past and how other people lived and believed. I also enjoyed the photos and drawings that appeared on the pages." "Now that I've read this story, I want to go back and read Cocchio's first novel, Be Careful What You Wish For, to see what period of time she chose to feature. " Best friends, Emily and Megan, are thrilled to find out that the amulet they bought at a Medieval Fair is supposed to make wishes come true. The magical amulet sends the girls on a fantastic journey back in time to 15th century England, where they encounter a host of unforgettable characters. Anne and her cousin, Richard, help the girls to try to uncover the truth about the amulet. Will they find the answers they need to return to their own time? Can they avoid being caught? Join the girls and their new friends in this exciting adventure back in time. I know D.L. 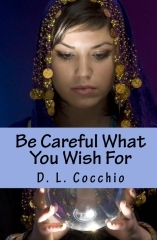 personally and I read the book Be Careful What You Wish For back in 2003 when she first released it. Last week Debbie and I spoke on the phone and I remembered this book was on my shelf. As I hung up, I grabbed the book and read it again. It was fun to remember the last time D.L. and I had spent time together we were at the Renaissance Faire in Tuxedo, NY and I was unknowingly pregnant with Handsome. It was a fabulous day and I must have eaten 3 huge pickles from the pickle guy who walked around with a big barrel selling them for $1.00 each. She joked that I might be pregnant and I said, "Nah, I really love pickles." Emily and Megan are BFF's and spend all their time together. They are almost like sisters and love being together like most girls their age. While at the Medieval Fair in Sterling Forest they encounter a gypsy who sells them a beautiful gem hanging on a thin, gold chain. The Gypsy explains to them that it was her Aunt Ramiza's and it is an amulet. She gives it to Emily for $5.00 because Em reminds her of herself. She wraps it up and tells the girls she hopes their wishes come true and to "be careful what you wish for." When the girls get home the girls head upstairs to act out one of their made up plays. They dress up in 15th Century clothing and adding the amulet to the costume, say "I wish were really were in the 15th Century." D.L. takes the reader on a journey as the girls get to really see what life was like in the 15th Century. The book spans multiple genres as it is part adventure, mystery, historical fantasy, science fiction and mystical, all wrapped in a pretty children's book ribbon for ages 8-12. To Purchase: Visit the book store at http://www.dlcocchio.webs.com where you can purchase the book including an autograph for $9.95. Best friends Emily and Megan, and their friend Ben have recently landed the leading roles in there upcoming school play. The play is based on the Salem Witch Trials in the 1600's, which the girls know little about. They decide to get some books to study, try on some costumes, and prepare for their new roles. Perhaps they will even use the amulet, a magic necklace they received the previous year at a Renaissance Fair that transported them back in time. After studying for a while and finding the perfect costumes, the three decide the only way to be truly prepared is to use the amulet and experience the Witch Trials firsthand. They gather a few items, link arms, and embark on their adventurous journey to Salem in 1694. The three kids find themselves with the real life Abigail and her housemaid Tituba, who teaches the neighborhood kids all about the ancient traditions of magic and voodoo from her homeland of Barbados. I liked this book a lot. I like that it was about witches, I didn't know anything about the Salem Witch Trials before. I liked that there was some magic involved and that they got to travel back in time. I really liked that they had to solve a puzzle in order to go home. I didn't want to put this book down. I really enjoyed the story and look forward to reading the other book in this series. We read this book together, switching off reading aloud at each chapter. It took a little while to get going and the dialogue through the beginning, at times, seemed forced and unnatural. It seemed the author was trying too hard to sound like a kid. Once we got into the meat of the story it flowed nicely. I loved that this book was historically correct and that, like the Time Warp Trio series, it can be used as educational material as well. It is a very quick read and does not contain any challenging vocabulary, I would rate it for 8-10 yr olds. It doesn't hold the same complexities as City of Ember or Harry Potter caliber Junior Fiction, but instead is a great intro to historical fiction for children. Overall a fun read and a great experience to read it together. The Author surprised E by sending her complete care package including a bookmark and amulet just like in the story! She has been wearing her amulet almost every day and I am sure, wishing she too could travel back in time! This story is truly magical. Rating…* * * * This is E's Rating... I would have given 3 flowers, but she insisted on 4 :) It is a children's book after all!